The world is seeing an increase in the number and intensity of extreme weather events such as floods, droughts, hurricanes and wildfires. Who will foot the bill? Will insurers have to hike up premiums, play legal hardball to protect itself from losses, or just retreat from danger zones to pre-empt financial losses that could bankrupt the industry? There are some signs of this industry flight from high risk zones. In California, just 12 percent of homeowners are covered by earthquake insurance, down from about a third in the early nineties, according to the California Earthquake Authority. In Florida, the state has stepped in as insurer of last resort as insurance companies flee hurricane-prone areas. But a new financial product has emerged in recent years with an irresistible value proposition: Investors can now cash in on catastrophe, and poor countries can insure themselves against the worst, most damaging disasters. 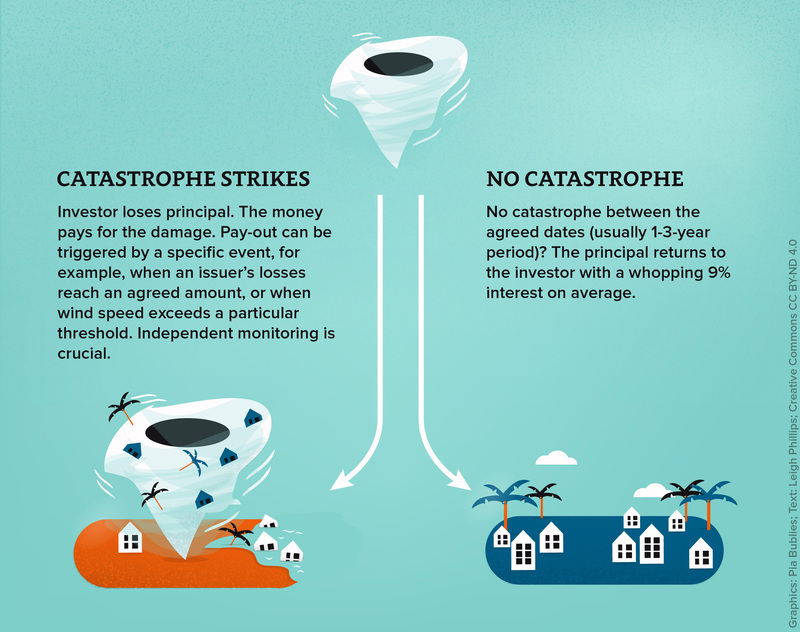 Catastrophe bonds’ have had a bumper year in 2014, generating headlines in the Wall Street Journal like “Investors turn to catastrophe bonds to boost returns”. ‘Cat bonds’ first appeared in the 1990s after insurers began to realize that increasingly major catastrophes could incur a scale of damage that even reinsurers – the people who insure the insurance companies – might not be able to cover. 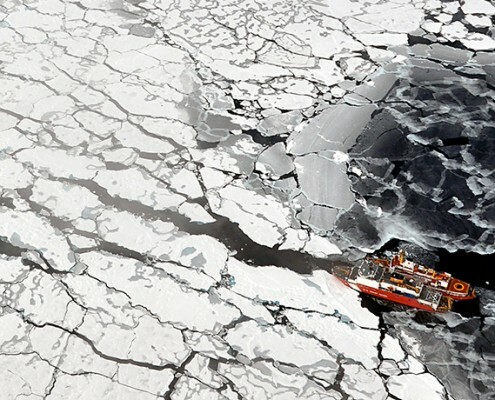 The sector was equipped to swallow a major multi-billion-dollar catastrophe roughly once a decade, but events costing tens of billions of dollars much more frequently could ruin them. The only pool of cash large enough to underwrite such losses lies in capital markets – the collection of big investors like pension funds, hedge funds and sovereign wealth funds that normally invest in stocks and bonds. When an insurance company sells you a policy on your house, they are sharing out the risk via the premiums they collect from you and from all their other customers. If your house burns down or gets washed away in a tsunami, the money made from investing the premiums gathered more than makes up for the losses. But if the houses of all their customers in a city are washed away, they would run into trouble. This is where reinsurers step in. Here, the risk is shared by offering reinsurance to multiple insurers because the likelihood of all or lots of reinsurers not having enough capital to meet their obligations at the same time is pretty low. Or at least it was. With cat bonds, it’s like kicking the risk-sharing up another level – to global financial markets, whose 2012 market capitalization was $55 trillion – where even losses in the hundreds of billions would have the effect of a gnat biting an elephant. Companies and governments regularly issue bonds to raise capital. Investors lend them money (the principal) and in return, the issuer of the bond pays an interest premium (a coupon). At an agreed time later (the maturity date), the principal is returned to the investor. Cat bonds aren’t really very different. A government or group of governments facing climate or other disaster risks—such as nations in the Caribbean facing increased tropical storms and hurricanes—will issue catastrophe bonds to large-scale investors such as hedge funds in just the same way. Sometimes the bond issuer may be a public agency such as the New York Transit Authority and quite often the bond issuer may even be a reinsurance company itself worried about their losses due to reinsurance pay-outs in the event of a disaster. The bond issuer will also usually already have some other sort of insurance as well, with the cat bonds covering the rest of what they think they may need in the event of a disaster. These bonds cover a specified period—usually one to three years. The bond issuer pays the investors a mighty high rate of interest—averaging nine percent in 2013—for the principal. The principal is then parked in a collateral account from where the funds are invested in very low-risk securities. If a mega-catastrophe occurs before the maturity date, the investor loses his principal. The issuer of the bond gets to keep the principal to help cover the extreme losses incurred by the disaster. But if there is no mega-catastrophe, the principal returns to the investor, who has now also made a handsome pot of money from the interest. The government or public agency or reinsurer will then start all over again, announcing a fresh bond sale for another, say, three-year period. Despite extremely poor credit ratings (typically BB or B- —equivalent to non-investment-grade junk bonds) for their high risk, cat bonds have become an incredibly popular place for yield-hungry investors to put their money due to this high rate of interest. 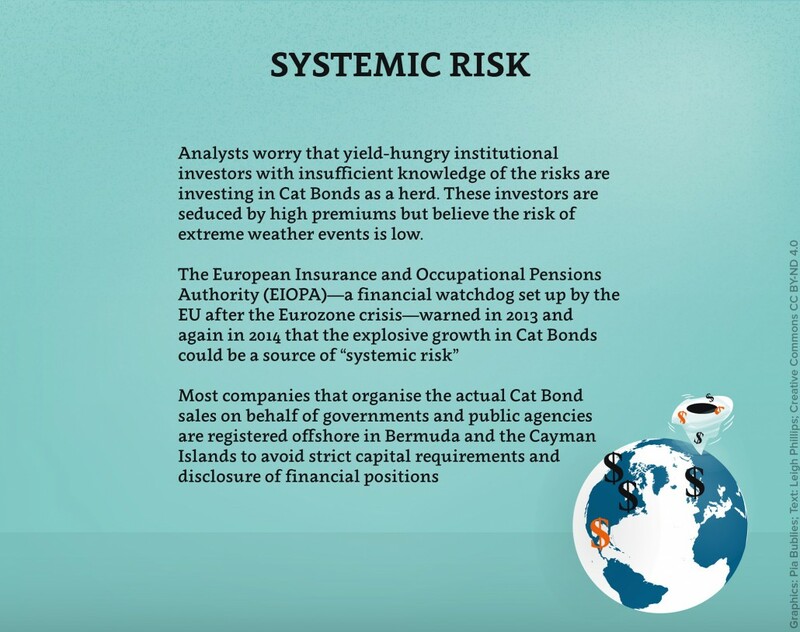 Initially the market was dominated by hedge funds, pension funds and sovereign wealth funds, but cat bonds are now also being purchased by endowments and individual wealthy investors. The government does not issue the bonds directly, but rather an investment bank or insurance company will establish a special purpose vehicle based offshore—in essence a new company—which issues the bonds on their behalf. Another wrinkle is that in the event of a disaster, the bond can be triggered in a number of different ways, including when an issuer’s losses amount to a certain figure, or when certain parameters such as wind speed exceed a particular threshold. Thus modeling of these parameters by independent agents plays a crucial role in determining who gets paid and when. 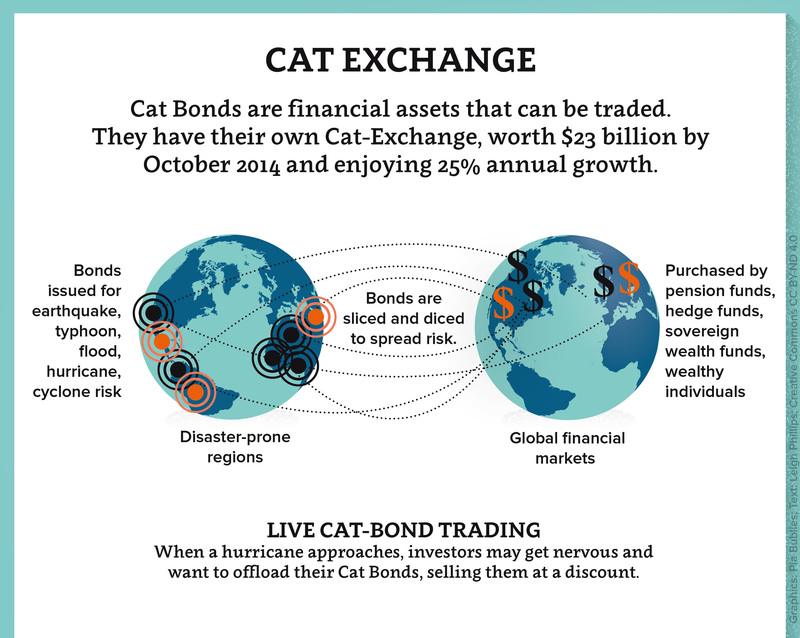 Finally, a cat bond—like any bond—is a type of debt security, meaning it is a financial asset that is tradable. The market price of a cat bond, like any bond, amounts to the value of expected future interest and principal payments. But if an investor sees a better investment, she may want to sell her cat bond. 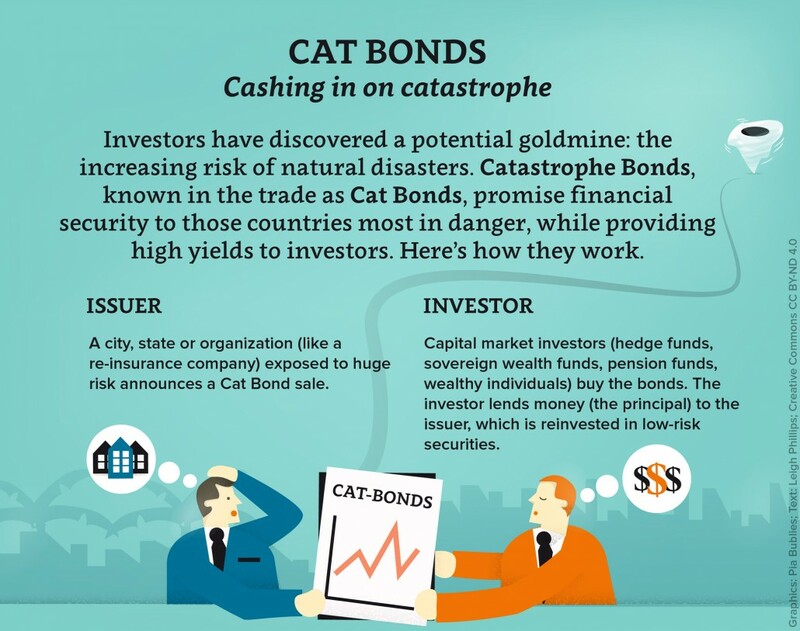 Equally, if the investor reads about a hurricane approaching land and gets cold feet, he may want to offload the catbond at a discount to another investor with a stronger stomach for such risk—a phenomenon called ‘live cat-bond trading’. In short, these bonds have allowed governments, public agencies and reinsurers to transfer the risk of large catastrophic losses from disasters to capital markets. After a puttering launch of the concept with $1-2 billion worth of cat bonds issued from 1998-2001, and a bit of a pick-up after 9/11 to $2 billion, after Hurricane Katrina, the market doubled to $4 billion. Last year it soared to $7.1 billion. This year, a surge of interest pushed issuance to double in the first quarter over the same period in 2013, to $1.2 billion, hit a record high of $3.5 billion in the second quarter, and quieted down somewhat in the third quarter. With three months left to go in 2014, some $6.6 billion has been issued this year. The market, worth $23 billion in as of October, has enjoyed annual growth of 25% for much of the last decade, compared with 10% for the rest of the insurance sector. BNY Mellon, the Wall Street bank, has gushed that the sector has “huge potential”, predicting growth to $50 billion by 2018 as part of the larger insurance-linked securities (ILS) market that will climb to $150 billion. This compares favourably with the current estimated $215-220 billion size of the global reinsurance market. The rush into cat bonds is driven by multiple factors. First, the rate of return is remarkable as wealthy nations stumble out of recession. Secondly, cat bonds are investments that are uncorrelated to how well the wider stock or bond markets are performing, permitting investors to continue to profit even at times of market decline or the recent European sovereign debt crises. Indeed, there is such a hunt for yield at the moment that there is more capital wanting to get into this market than the existing catbond market can absorb. Lastly, while there is a growing awareness of the role of climate change in natural catastrophes that also drives the market, the last decade has actually been an unusually quiet period for catastrophic events, allowing for losses on cat bonds to be quite rare so far, with just three having been triggered out of the roughly 200 issued to date. This combination permits investors—particularly the less sophisticated operators who are not hiring statisticians and meteorologists to help them understand what sort of product they are buying—to believe they can have their cake and eat it: earn high yields without the accompanying risk. However, one big catastrophe with substantial losses for investors should shake out the diletantes, according to market watchers. Public-sector authorities are also getting into the game, and while the bulk of the market remains focused on the global north, international financial institutions are also strongly pushing cat bonds as a way for developing countries to build resilience against climate cataclysm. In April this year, Florida’s state-run insurer for property owners that cannot obtain insurance elsewhere, the Citizens Property Insurance Corporation, made a $1.5 billion cat bond offering – the biggest single cat bond transaction on record. In another example of public agency getting into the cat-bond game, after New York’s Metropolitan Transportation Authority (MTA), suffered a $5 billion dollar hit from Hurricane Sandy, insurers were reluctant to underwrite the MTA again. So the transit authority set up a Bermuda-registered vehicle, MetroCat Re Ltd., to issue $200 million in cat bonds directly to Wall Street. Mexico was the first state to issue cat bonds. 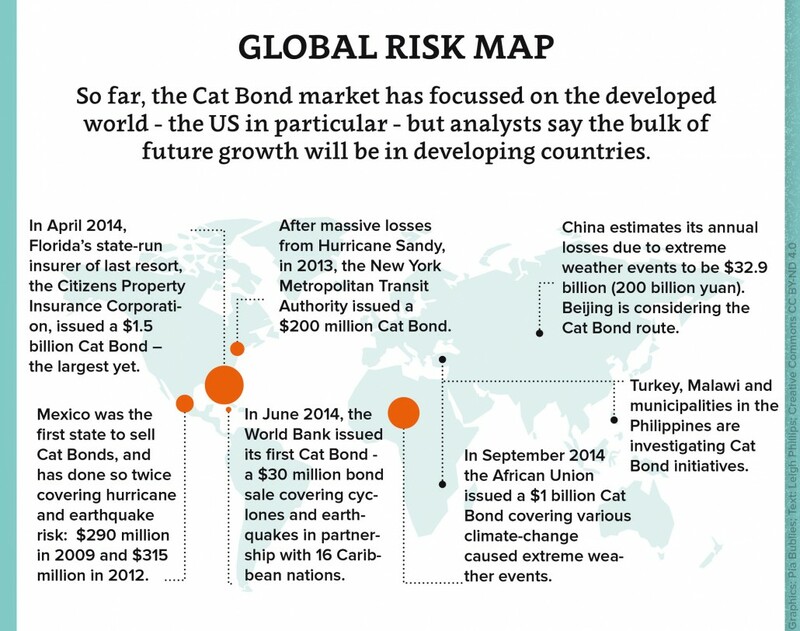 The government has issued cat bonds twice so far, a $290 million tender in 2009 to cover earthquake risk, and a highly-subscribed $315 million offering in 2012, to cover earthquake and hurricane risk along the Atlantic and Pacific coasts. Both tenders were arranged by the World Bank under its MultiCat Program, which is keen to see the model embraced by other developing nations as a way to reduce the increasing pressure on public finances from natural disasters and maintain balanced budgets. Then in June this year, the World Bank issued the first cat bond of its own, in partnership with the freshly established Caribbean Catastrophe Risk Insurance Facility (CCRIF). 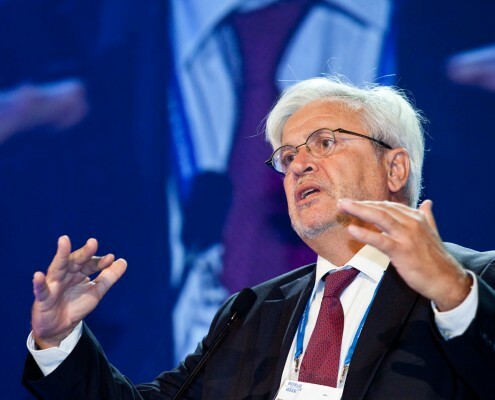 This $30 million offering pools the risk of 16 nations including Haiti against tropical cyclones and earthquakes, although CCRIF is expected to expand its remit to central American nations in the near future as well. Similar programmes are being mounted to cover against Turkish earthquakes, drought-incurred shortfalls in maize production in Malawi, and general climate-related disasters affecting municipalities in the Philippines – with the latter brokered by the UN Office for Disaster Risk Reduction (UNISDR). 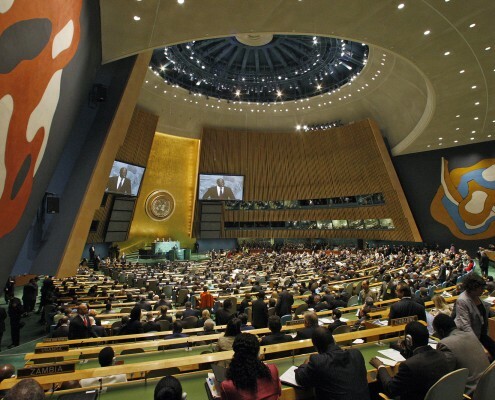 And at the UN climate summit in New York in September, African Risk Capacity, an agency of the African Union, announced the Extreme Climate Facility (XCF), a multi-year, $1 billion series of cat-bond offering that are to be offered over the course of 2016. With existing pledged climate finance from the developed world pitifully inadequate, particularly for adaptation to climate change, developing countries are beginning to see cat bonds as a fairy godmother, giving direct access to vast sums from capital markets arriving in the knick of time to make so many of their climate worries go away. Cat bonds are seen in part as a replacement for near non-existent public-sector climate finance. While the cat bond market has so far been focussed on the developed world, and the US in particular, the key players in this new market believe the best is yet to come from the developing world. Lloyd’s of London estimates this gap, defined as the minimum levels of coverage necessary, at $168 billion annually, with the largest single gap being in China. These companies, alongside institutions such as the World Bank, the UN and the African Union, believe they are onto a a win-win for the catbond industry and for cash-strapped governments. Rather than having to rack up unpredictable amounts of debt, increase taxes, or slash government programmes in the wake of disaster – after the fact, they can lock in funding for disaster relief ahead of the event occurring. 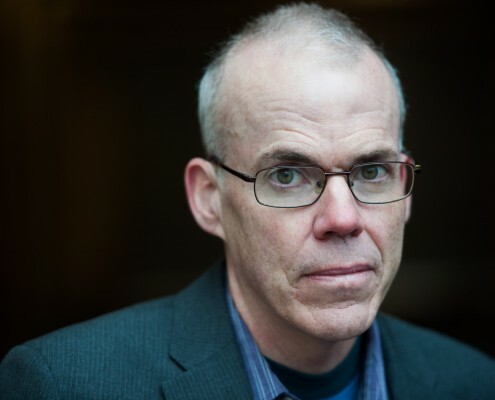 However, climate adaptation experts and some financial regulators have warned of the downside, pointing out potential for undermining climate resilience, questionable ethics, and, even the possibility of re-introducing the very type of systemic risk that led to the 2008 global economic crisis. The Climate Bonds Initiative, an international non-profit set up in 2010 to promote climate investments, prepared a 2013 report for HSBC on the broader category of climate bonds that came down against cat bonds. “It is possible that cat bonds, by the nature of the insurance they represent, could result in less climate resilience on the ground,” the authors wrote, arguing that the existence of such a market might introduce an attitude of complacency amongst the insured. It could dis-incentivise the necessary changes in planning, building and infrastructure required to adapt to climate disaster, and incentivise construction in areas at risk to extreme weather. There are ethical concerns. It is likely that the most vulnerable are least likely to be insured, or be able to pay an extortionate premium to be covered. Much like how private health insurers in the US refuse to insure those at high risk of cancer, the investors in catbonds are less likely to be able to provide coverage for those least developed countries most at risk of climate chaos, such as Bangladesh. Indeed, there are certain to be “uninsurable” regions, just as there are millions of Americans without health coverage. 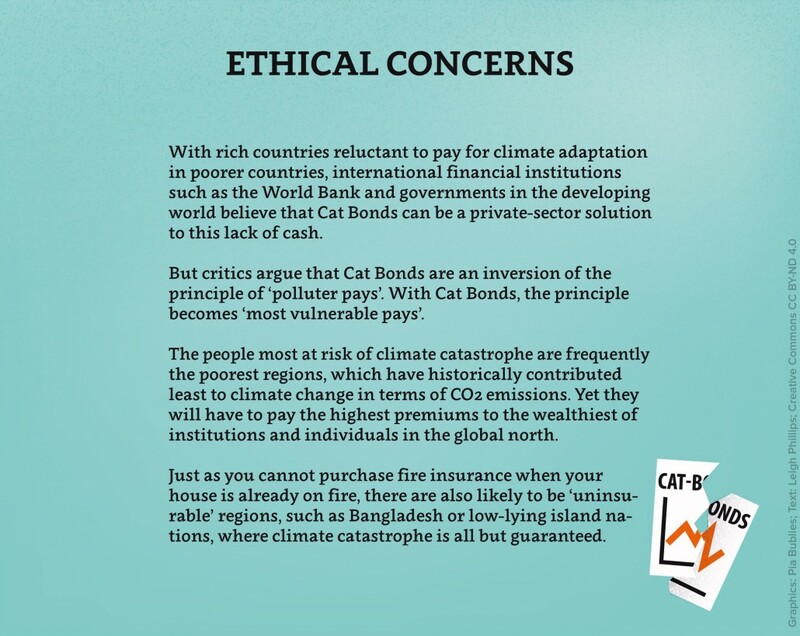 Rather than modelling climate insurance on a Scandinavian or Canadian socialised system, ensuring that everyone is equally covered, the catbond market replicates the broken healthcare system of the USA with its storied injustices. Here, due to increased premiums paid to already wealthy northern investors by southern governments least able to pay, there is a transfer of wealth not from north to south, but from south to north – a situation Swedish scholars have described as “particularly odious”. Instead, Duus-Otterström and Jagers propose a welfare-state-style social insurance programme for climate catastrophe, where governments pool risk and resources centrally. Every nation would pay in to such a global system based on their ability, and pay-outs from the system would be tied to the ability to handle the costs of a disaster. Finally, insurance regulators are asking whether the complexity built into this securitization of insurance products can restrict investors’ capacity to monitor their risk exposure. Much of this new market is located in Bermuda and the Cayman Islands – not so much because of their tax haven status, but because they are less stringent that Europe or the US on capital requirements and disclosure of financial positions—a situation that only contributes to concerns about opacity. ‘Underpricing risk’ means that large sums of money that are not expected to be lost could indeed lost as a result of a disaster. Such large unexpected losses by major institutional investors would ripple outward through the wider financial system in the same fashion as the knock-on effects of the sub-prime mortgages crisis which was triggered by a broad and unexpected decline in house prices, mortgage delinquencies and foreclosures. The market for ILS products like cat bonds had been growing apace since 2001 only to be disrupted by the collapse of sub-prime collateralised debt-obligations (CDO). And indeed, the European Insurance and Occupational Pensions Authority (EIOPA)—one of the tough new financial supervisory watchdogs set up by the EU in the wake of the 2008 global economic crisis—has noted with unease the explosive growth in the market in cat-bonds and the associated insurance-linked securities (ILS) market. Since the global economic crisis and the multi-trillion-dollar bail-outs of the financial sector, northern governments have pleaded poverty. 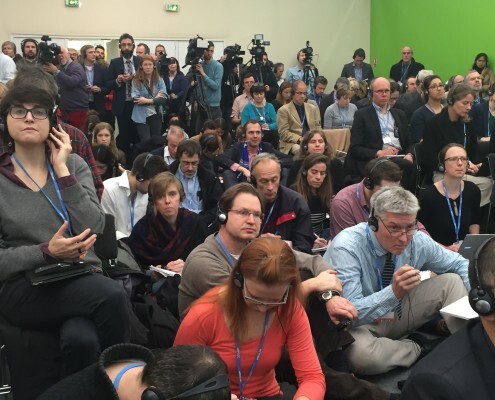 When it comes to climate finance, they cry that the cupboard is bare and they just can’t afford the scale of funding for climate mitigation and adaptation that the developing world is demanding. It is of course ironic that the encouragement of the use of catastrophe bonds by the developing world as a solution to this lack of climate cash, northern governments are embracing the same process of wild-west securitisation of debt that caused the problem in the first place. The infographics from this article, created by Pia Bublies, are available for download as a set of seven slides or in one combined image. They’re under a Creative Commons license, so you’re free to use them! Written by Leigh Phillips. Published on November 18, 2014. Last edited on June 5, 2015. 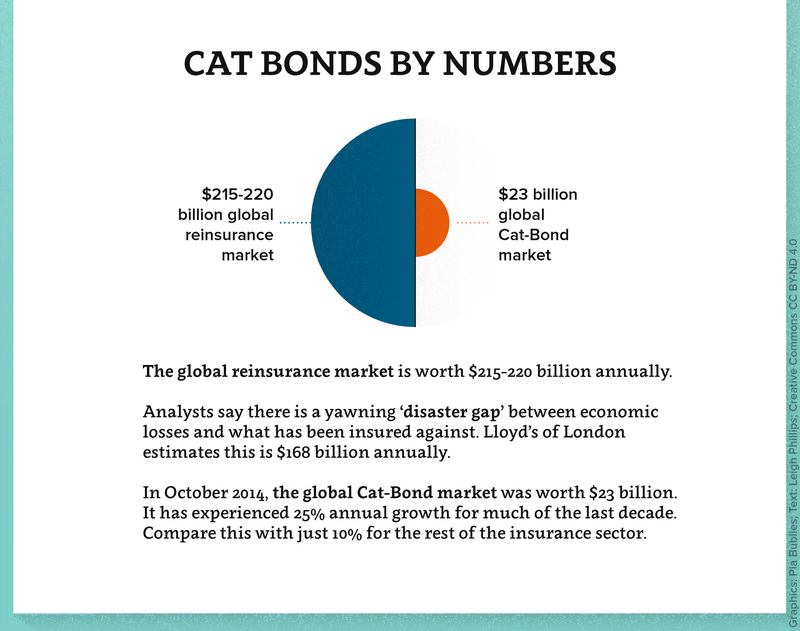 As you write, the size of the Cat bond market is some USD 23bn. Compare this with the size of the multi-trillion-dollar debt market. Don’t you think, therefore, that your conclusion neglects scale / proportion? To me, it sounds too fundamentalistic. But otherwhise a very well written and comprehensive article. With respect to flood hazards from rivers, I’ve wondered if either a reinsurance company or a small percent insurance premiums could fund some river restoration projects that helped reduce downstream flood risk. If sections of a river could be reconnected with their floodplain, there would be a big ecological benefit, but in some places, this reconnection with the floodplain could conceivably store enough water, or slow the flood wave down, such that downstream homes and businesses experience a lower flood level. If such were the case, the money spent on the restoration project would have the benefit of improving the river’s health, and damage claims could be reduced. Currently, at least within the US, state and federal funds are what pay for river restoration projects. If a reinsurance firm or portions of a CatBond were funding such a project, it’s clear that a return on investment would need to be made, so post-project assessment would be very different. Over time, perhaps these assessments could mature and include information about how the project also helped say fish populations, riparian forests, or reduced bank erosion. Given all the modeling that AIR, Eqecat and RMS perform, I wonder if their models could be configured to ask the question, where would a floodplain restoration project most reduce the risk to downstream policy owners?